To produce single malt whisky you only need three ingredients, Malted Barley, Water and Yeast. Distilleries will have their own style of whisky due to many reasons, such as the water used, the size of the copper still, maturation, chill filtration and more. At Mitchell’s Glengyle Distillery we believe in keeping things natural. We use our local water source, Crosshill Loch, to supply us with water throughout the process, from steeping the barley until diluting the whisky at the bottling stage. We let the spirit mature at its own pace in our warehouses and when it is time for bottling we do not chill filter our whisky, neither do we add any caramel colour to it. Our malt/mash/still men and women have worked so hard to develop all the character in our malt that we would be mad to remove all of these good bits from the final product! Here is an overview of our production of Kilkerran Single Malt Whisky. At Mitchell’s Glengyle Distillery we try to use locally grown barley as much as possible. The reality is that the amount of local barley we use vary from year to year depending on the quality. Most of our barley has been grown on the East coast of Scotland, the climate over on the East coast is better suited to growing barley than the wet and windy west coast. One thing is for sure, we’ll always be using Scottish grown barley for our whisky production. The barley is malted in traditional floor maltings at the neighboring distillery, Springbank. 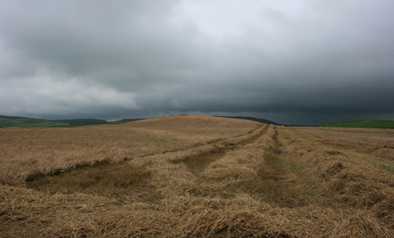 At Springbank the barley is put in a cast iron steep with Crosshill loch water, the steeping process takes 48 hours. The steeping ‘tricks’ the barley in to thinking it is spring and it is the beginning of the germination stage. Once the barley has soaked up all the water and is saturated, the barley is spread out on the malting floor in a thick layer of about 10cm, here it will continue to germinate during the next 5 - 7 days. To prevent the barley, or green malt as it is now known as, from knitting together we take turns in turning and grubbing the floor. These are traditional methods used to regulate the temperature in the green malt as well as keeping the grains separated and prevent them creating a thick carpet of malt. The turning and grubbing takes place every 4 hours throughout the day and night, the green malt never sleep, so it is important to look after it through out the germination process. Once the starch inside of the grain has reached the optimum content for our purpose, it is time to stop the germination process. The germination is stopped by applying heat, the heat comes from the fire in our kiln. The malt floor will be emptied and transferred in to the kiln for the drying out process. The Kilkerran malt is dried over peat fire for six hours and 30 hours of hot air to produce a lightly peated malt of roughly 15 parts per million phenols. We now have our malt ready for production. The milling process at Mitchell’s Glengyle Distillery is operated by a Boby mill, given to us free of charge from Craigellachie Distillery when they updated their milling equipment. It takes one hour to mill four tonnes of malted barley. The malt is split in to the following composition as a result of the milling, 10% flour, 20% husks and 70% grist. At Mitchell’s Glenygle Distillery we have a new semi lauter mash tun, purpose built for us in 2002 by Forsyths of Rothes. A full mash cycle runs for 7-8 hours, during this time it mixes four tonnes of grist with 3 sets of hot water. The mash tun is equipped with a stainless steel arm, the arm moves forward and backwards slowly to allow for the wort to settle and eventually get collected in the underback. The wort is then transferred to the washbacks. Our washbacks are made from boatskin larch. We currently have four washbacks at Mitchell’s Glengyle Distillery, each with a capacity of 30,000 litres. We’ve even got space to install further washbacks in the future. Once the wort has been transferred to the washback we add a slow acting distillers yeast. The wort is rich in the sugars from the mashing process and the sugar will act as feed for the yeast to multiply in numbers. A typical fermentation at Mitchell Glengyle Distillery lasts between 72-110 hours, at the end of this process we are left with an ale of 5% ABV. The other bi-product, apart from alcohol, is CO2 which is piped directly outside from the washbacks. We find that having such a long fermentation and using natural material such as larch, gives us a fruitier ale which in turn produces a fruitier spirit in the distillation process. At Mitchell’s Glengyle Distillery we do a traditional scottish double distillation. Our copper stills came from a closed distillery called Ben Wyvis. We had to re-shape the copper stills to our preference prior to installation. The wort exits the washback and goes into the wash still where it is boiled up to produce a vapour. The vapour is cooled down by the condensers, also purchased from Ben Wyvis distillery, and we are now left with a liquid called Low wines of around 21-23% ABV. The Low wines are re-distilled a second time in our second still called the spirit still, this produces an even stronger alcohol called feints. The heart of the spirit run is collected at 68% ABV in the spirit receiver situated on the lower floor of the distillery. The pot ale and spent lees are collected in the effluent tank at the back of the distillery, to be collected by local farmers to use as fertiliser in theirs fields. Nothing goes to waste! The spirit collected at 68%ABV is measured and diluted down to 63.5%ABV using Crosshill loch water. It is then filled into a mixture of casks, we use sherry and bourbon mainly, hogsheads and butts, but we also use some more unusual wood types such as Port, Madeira and Rum. Once filled, the casks are transported to Springbank distillery, by tractor, for maturation. The spirit cannot be called whisky until it has been matured in Scotland for at least three years. We mature our whisky in two types of warehouses, rack and dunnage warehouse. The dunnage warehouse is an old traditional style warehouse with earth floor and sticks for stacking aid, the casks are piled no higher than three casks high. The rack warehouses are more modern and have steel frames that can take up seven casks in height. This is the more space and cost efficient way of maturing whisky. Our first casks were laid down in 2004, we are currently bottling every year but we’re keeping some whisky behind to grow older. Once the whisky reach 12 years old in 2016, we’ll be bottling what will become our flagship whisky. However, we will be continuing to mature some casks further for exciting future releases. Once our whisky has matured for the required time, it is time to bottle. We use the bottling facilities at Springbank distillery. The casks are selected for bottling and vatted together with water from Crosshill loch to a strength around 2%ABV above the required bottling strength. We leave our casks now to “marry” the water and whisky together for up to six months prior to bottling. Once the marrying has been complete, the casks are emptied in the bottling hall and the whisky fed through the bottling line. We have a semi automated bottling line, each stage is manned by a person so we have every attention to detail covered. Not at any stage during bottling do we chill filter our whisky, neither to do we add any caramel colour to the product. Our whiskies are normally bottled at 46%ABV, but some are left at cask strength.